Last week, my husband and I were excited to meet a new, developmental pediatrician that has received rave reviews from many Mothers in our area. The clinic is prestigious and known for providing expert and timely help for special needs children coping with a wide range of complex to serious medical issues. We were hopeful that this may be the very doctor we have been searching for to really listen and consider my son’s health needs – without the fast paced cookie-cutter approach favored by so many doctors today. Overall, the appointment went well enough. My son’s doctor was gentle, understanding, and very kind throughout the exam. He had a calming effect on my son that was never present with any previous physician’s. However, when we got midway through my 4″ binder of Wyatt’s medical history, we screeched to a halt on the matter of vaccinations. Now, this is not a new debate to me, nor is it a surprising one, but I was a little surprised at how close-minded the doctor became upon discussion of the known risks and potential for vaccine damage in children with a predisposition to adverse reaction. He waved it off nonchalantly with a mention of how many parents are misguided by celebrity-driven medical advice and quack-extremist websites. I am ready for more debate with this doctor and know we are game for real investigation into the root cause of past vaccine reactions. He has referred us to an immunologist for further testing and digging – so I’m hopeful that this may provide some of the answers we’ve been trying to find for years. What’s on my wish list? I want to know if my son has a sulfate or glutathione deficiency, metabolic dysfunction, or methylation pathway abnormality before I consider any future vaccination. I’d like answers for the continued G.I. complaints, that are now much improved, yet lingering with undetermined cause. If there is a way to correct such a deficiency upon discovery, then this may enable a path where my son could be safely vaccinated in the future – but only with a single dose, milk-protein free, G.E. yeast free inoculation – and only for truly critical vaccines NOT flu shots. 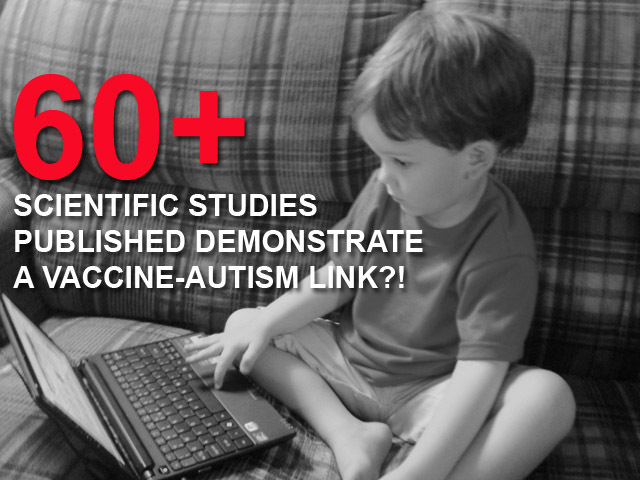 If you doubt the potential for adverse reaction, browse the list of more than 60 peer-reviewed scientific studies that demonstrate a vaccine-autism link. It’s quite impressive and revealing. I am so grateful for Ginger Taylor’s excellent list of studies supporting a vaccine/autism link. Shared by a friend online, this resource couldn’t have come at a better time; since my notes are scattered here and there in all manner of folders . Why do so many doctors rely on research conducted decades ago? How can they not question the rising prevalence rates (1 in 88, now 1 in 50…) and environmental factors? Why are they not aware of a vaccine’s ingredients or FDA mandated contraindications? Why do they like to lean on studies like this that report incomplete data that skirts around the real questions; like this recent study by the Journal of Pediatrics? This study is often cited as the proof that any vaccine-autism link has been reputed, which is simply not the case. This particular study focuses solely on the potential for adverse reaction with regard to the antigens and polysaccharides within vaccines, not the presence of heavy metals like Hg and Al, or the impact of genetically engineered ingredients like yeast, aborted fetal tissue, or other questionable ingredients. Well done, JPEDS, I agree that the antigens and sugars are unlikely to lead to an Autism diagnosis…but what about the real questions that remain here? Checkout Ginger’s up-to-date list on her blog. Print it out and keep it available for easy reference. Do you think my son’s new doctor might question the existing dogma if I printed out a hard copy of each referenced study? I think that’s how I’m going to handle this. Could you imagine the look on his face if I brought in 68 printed peer-reviewed scientific studies – delivered to him at our next appointment in Trader Joe’s paper bags?! (Yea, because I recycle…and have far too many of these bags saved up as it is.) Do you think he’d believe that I don’t rely on celebrities for my information after that?! I welcome the immunologist’s perspective and ability to help sift through potential root causes of my son’s past adverse reactions. Despite our difference in opinion when it comes to vaccines, this is a step that no previous pediatrician has been willing to do. For that, I am truly grateful. The place else could anyone get that type of info in such a perfect approach of writing?